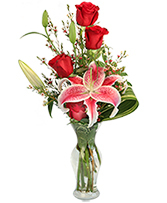 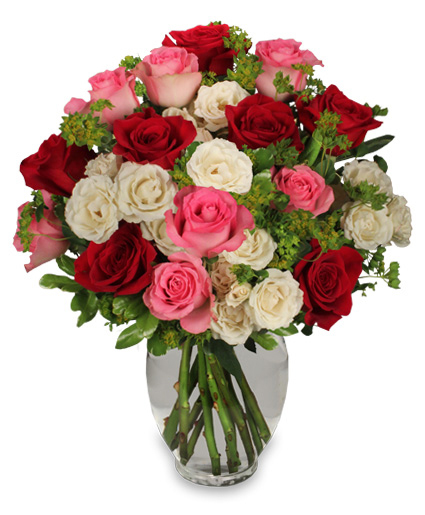 Romance of Roses send roses, roses delivery, rose delivery, buy roses, roses online, buy roses online, roses delivered, deliver roses. 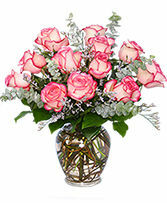 Classic Urn Vase, Foliage: Variegated Pittosporum, White Mini Sweetheart Or Spray Roses, Red Mini Sweetheart Or Spray Roses, Pink Mini Sweetheart Or Spray Roses, Bupleurum. 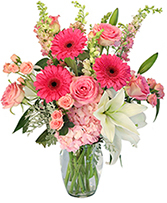 Ginger Vase, Curly Willow Tips (Twisted Inside Vase), Foliage: Baby Blue Eucalyptus, Salal, Pink Bicolored Roses, Misty Blue Limonium.